If this happened to me I would scream with the top of my lungs especially with all this circulating talk of the harassing mobs in down town. Vacci street is the main tourist haven. It is something like the champs Elysee in Paris. It has lots of beautiful buildings, and all the fashion brand names. So if you love to shop, that’s the place for you. However I was more interested in sightseeing than in shopping so I turned my head to the architecture of the buildings. What was really amazing for me was listening to all those musicians on the street. They were everywhere, in the metro stations, in the famous squares,,, But I really enjoyed the atmosphere they created in this street. There were lots of greenery of course. It was raining heavily on the second day of our arrival and Ohh I had so much fun walking under the rain 🙂 . Amazing !!! This is the Golden Park hotel where we stayed. It is a 4 stars hotel. Very clean. The rooms are a little bit small, but that’s ok. The most important thing is its proximity to the metro station. This is the Keleti metro and train station that was just infront of our hotel. The inside is huge of course. There were lots of Arabs standing by the doors asking if you want a cab, frankly they looked very suspicious with their not-so-clean clothes. That’s the automatic stairs in the metro station. You have to be very careful while riding it for the first time. It is very fast, and very steep ! I almost fell down while stepping on it, I thought it was just like any other automatic stairs we find here in Cairo. Last saturday I had the chance of visiting the monastery of St. Macarius in Wadi el Natroun with a group of friends. And I must say it really is a beautiful place. Actually this was my second time to visit it, but this visit was very special to me. first of all I discovered a lot about the coptic traditions, and also had the priviledge to talk with Father Kyriulius. He is really a great and pure man, when he was talking about the universal language of love (love of God and of all the human kind), I almost had tears in my eyes. And the monks there were all very kind to me even though I am just another veiled girl visiting the place. and the monastery of St Bishoy (Anba Pschoi). St. Macarius monastery can be considered the most important one. Note that it requirs a prior notification before entrance. There are the relics of the forty nine martyers killed by the Berbers and buried in the church of the Elders. Also the relics of John the Baptiste lies there after being transported from Jerusalem to Alexandria and then to the monastery (according to the monk who guided us in the monastery). I learned about Father Matta El Meskeen (20 September 1919 – June 8, 2006) who was the spiritual father of the monastery and who was a great scholar, he wrote many books (I bought from there “The Orthodox prayer life / حياة الصلاة ” which is supposed to be one of his first and most important books). This was indeed a memorable weekend. 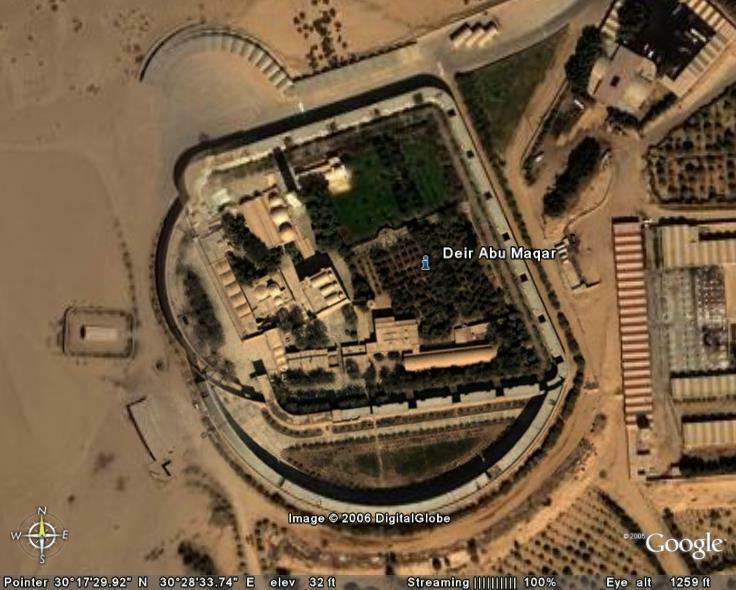 That’s the monastery from Google earth. To what should I be connected? my country? my religion? my origins? or just erase this question and consider myself just a ant in the human race? “Well,” he replied, “what if I do this?” He dropped it on the ground and started to grind it into the floor with his shoe. He picked it up, now crumpled and dirty. “Now, who still wants it?” Still the hands went into the air. A normal lens has an angle of view that approximates how the human eye sees a scene. A lens is considered normal when its focal length is approximately equal to the diagonal of the film format. Lenses shorter than normal are called wide-angle, while those longer are called telephoto. In 35mm photography, 50mm is considered to be the normal focal length, even though the actual diagonal of the frame (24mm x 36mm) is 43mm. For medium format photography (frame size 2-1/4″ square, or 6x6cm), normal is generally 80mm. A wide-angle lens is a lens with a focal length shorter than normal. A wide-angle lens, as opposed to a fisheye, is normally well-corrected for geometrical distortion, i.e., straight lines appear straight. However, as the angle of view is wider than what is seen by the human eye, they can create an impression of distortion; this perceived distortion increases as the focal length of the lens decreases. A fisheye lens (see below) is an extreme example of a wide-angle lens. A telephoto lens is any lens with a focal length longer than normal. A telephoto lens brings far subjects closer, like a telescope, hence the name. They therefore have a smaller angle of view than a normal or wide-angle lens. The longer the lens, the more likely that camera shake will blur the image; for this reason, longer telephoto lenses are usually used with a tripod to steady the camera. Circular fisheyes: have a 180 degree field of view when measured along the smallest dimension of the image, resulting in a circular image with black corners. In 35mm format, they usually have a focal length around 8mm. Full frame fisheyes: have a 180 degree field of view when measured along the diagonal, so the image extends on the full film plane. In 35mm format, they usually have a focal length around 16mm. In general, fisheye lenses are expensive and little used in everyday photography. Fisheye adaptors: auxiliary lenses are available that simulate a fisheye field of view. This is cheap way to play with the fisheye effect without investing in a dedicated fisheye lens, although, as with most auxiliary lenses, the quality of your images will not be the same as those taken using a ‘real’ fisheye.